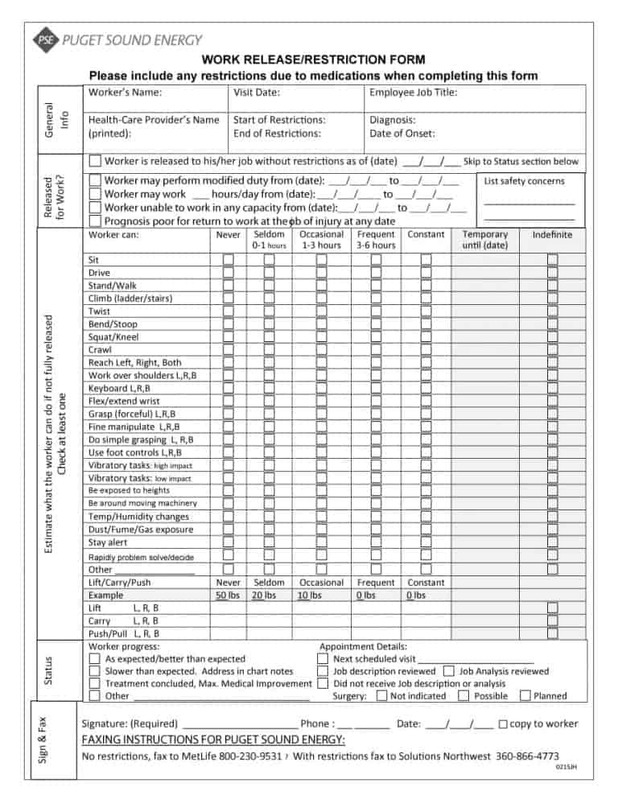 Today, you’ll find many different types of medical forms. 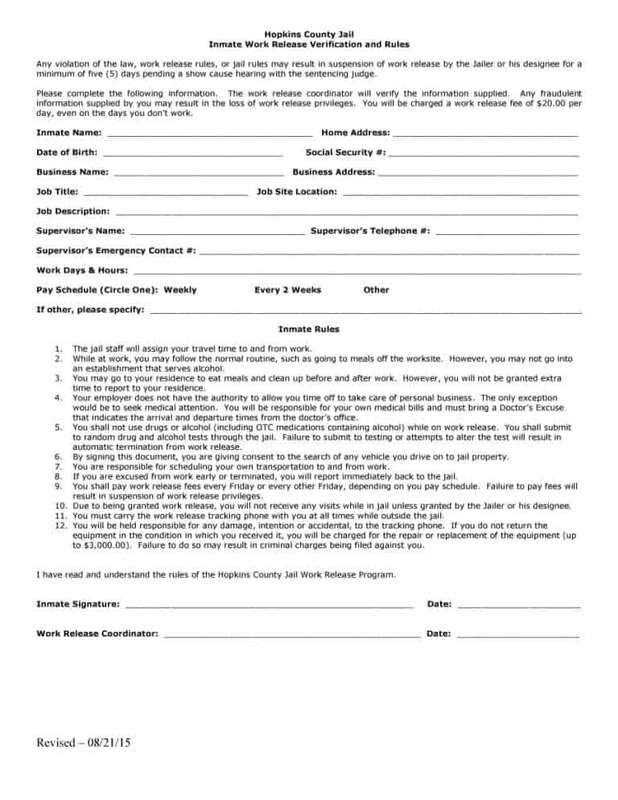 Some of these forms are common while others are used for special purposes. An example of the latter is a return to work form. 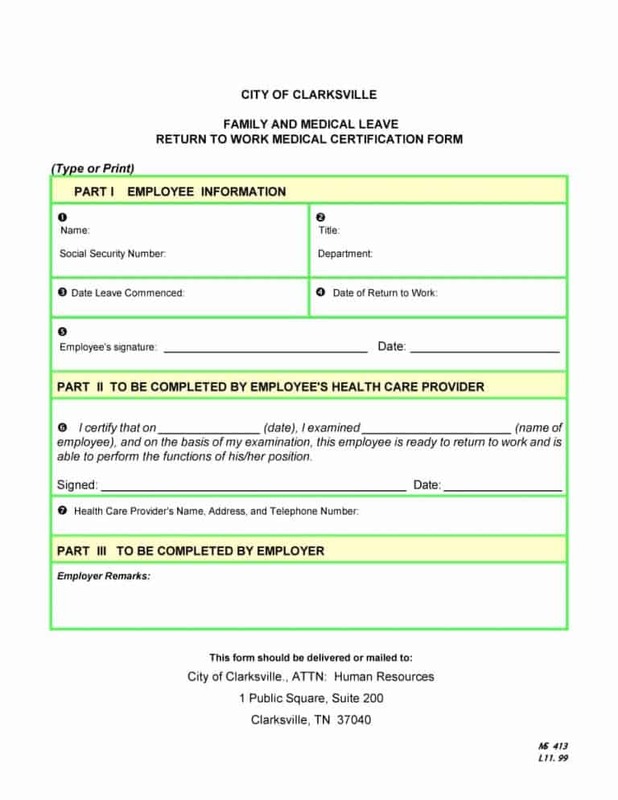 What is a return to work form and what does it contain? Let’s find out. After the employees return to work after sickness, managers are required to acknowledge and discuss with them the sickness absence period. Generally, a brief note is enough to record whatever was said during the discussion. 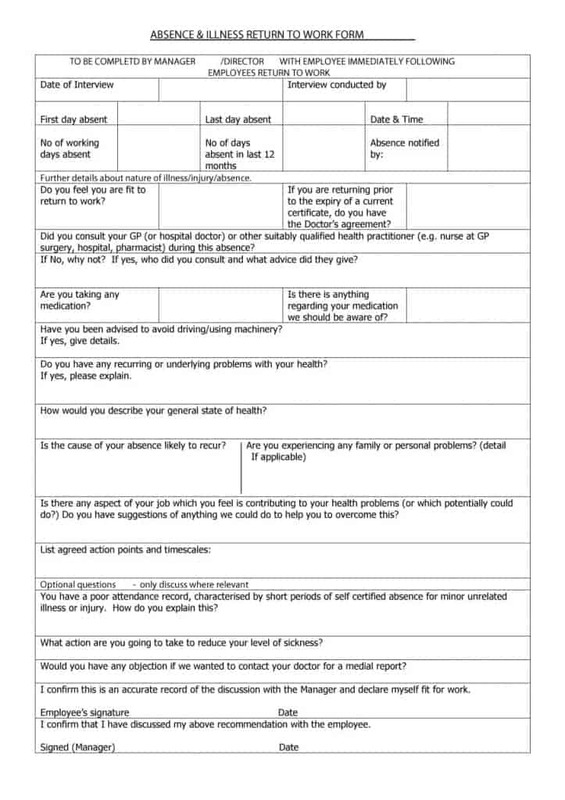 However, employees may be required to complete a comprehensive return to work form if they have an ‘absence pattern’ or if they have an underlying health issue that’s keeping them from coming to the office. Injuries and illnesses to employees can be costly for both the employers and the employees. However, with an effective safety and health program, employers can somewhat reduce these costs. A key part of the aforementioned program is a return to work form. 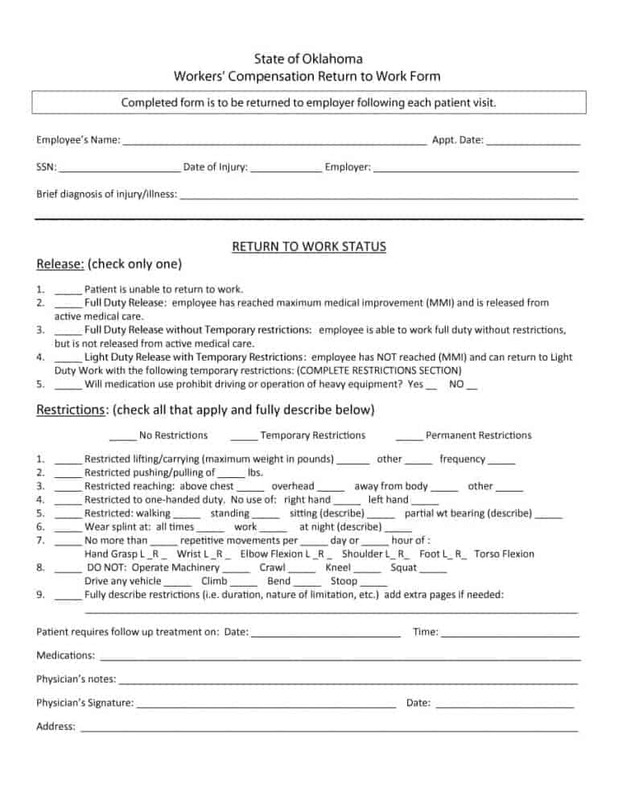 A return to work form helps organizations to minimize the financial and human costs of workplace injuries and illnesses. 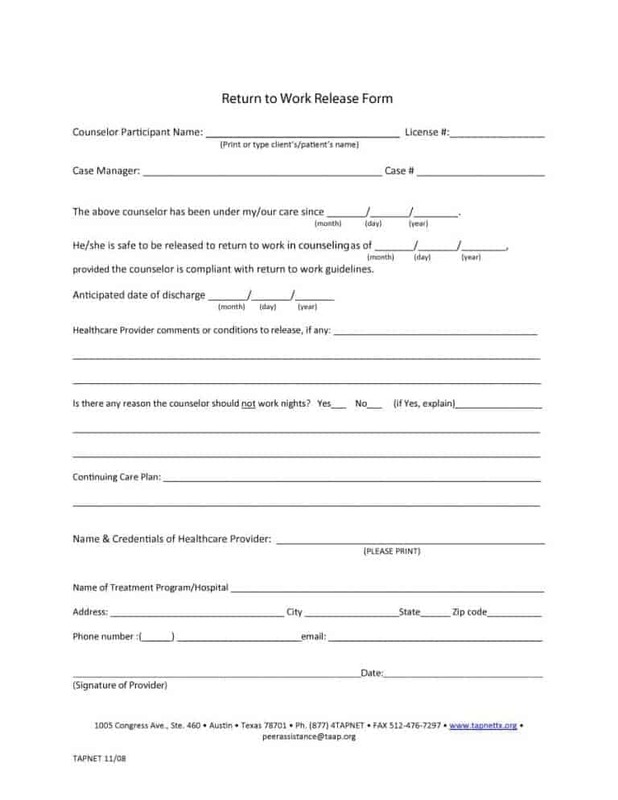 The return to work form helps to facilitate the returning workers by allowing HR and management to modify schedules, tasks, and working conditions. 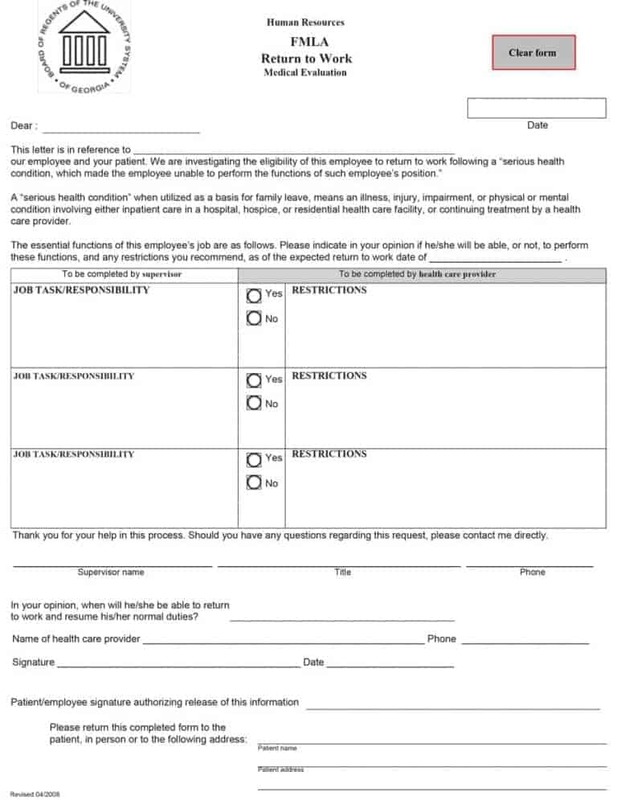 Talking about facilitating someone, patients can sign a medical release form to allow hospitals and other medical service providers to release confidential patient information to a third party. Coming back to the subject at hand, there are many reasons for organizations to have a return to work form for employees returning from sickness. The importance of a return to work form is what we’re going to discuss next. While some of the aforementioned reasons are genuine, the majority of the reasons given by employers to not conduct a return to work interview or have a return to work form are abysmal to say the least. The majority of the reasons given by employers to not a return to work interview or have a return to work form show that they don’t have a clear understanding of the return to work process. When an employee returns from sickness absence period, it is important for employers to assume that the employee was indeed ill. Also, employers should be accusatory or confrontational. While undermining the argument of the employee is something employers mustn’t do, they should have a record of the sickness. The only way you can do that is conducting a return to work interview and having the employee fill out a return to work form. If you’re someone who thinks that the return to work process is a waste of time then you need to know this: it takes no more than five minutes to complete a printable return to work form. Moreover, a return to work interview ends in less than ten minutes. The only thing about the return to work process that should concern you is having a haphazard approach towards it. 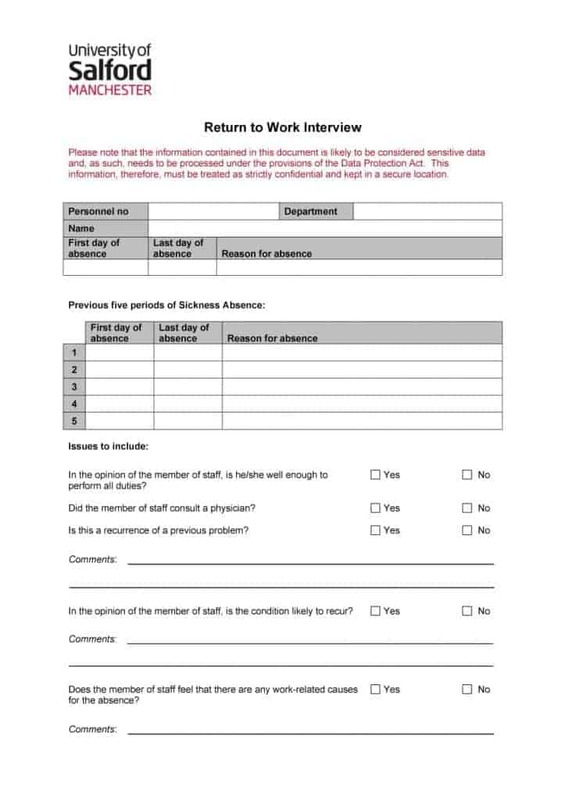 You must make the return to work interview and the return to work form part of your policy. This is the best way to deal with workplaces absences. 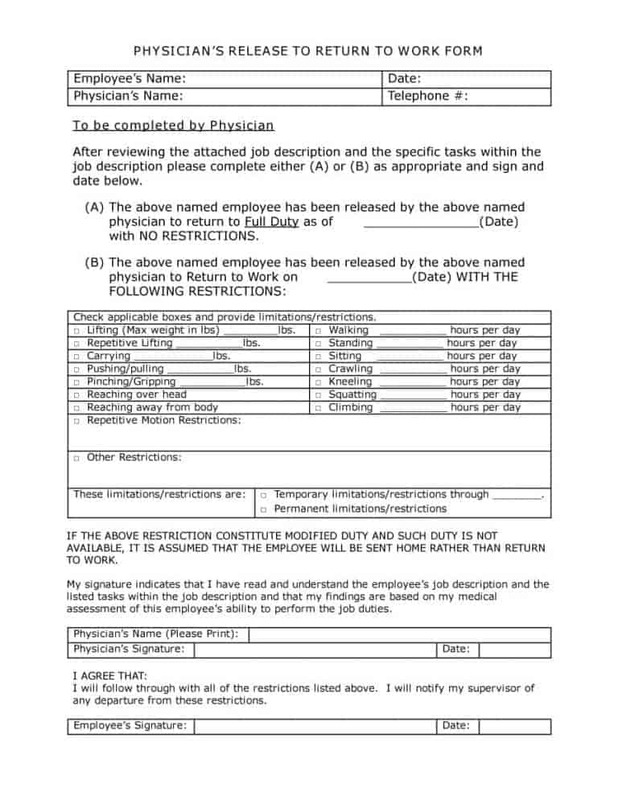 Before you find out what’s included in a printable return to work form, you must understand why it is required. 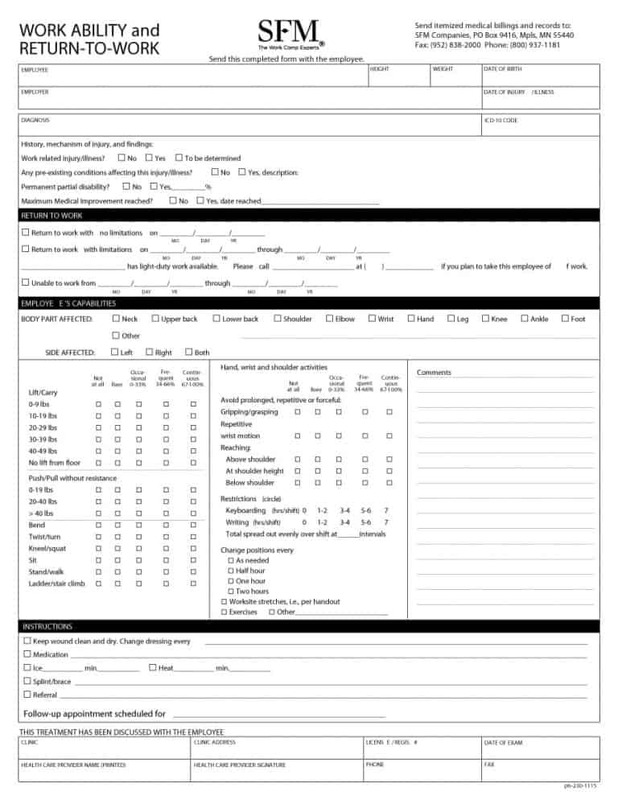 Used for good housekeeping in the workplace, a return to work form allows employers to track the comings and goings of employees. 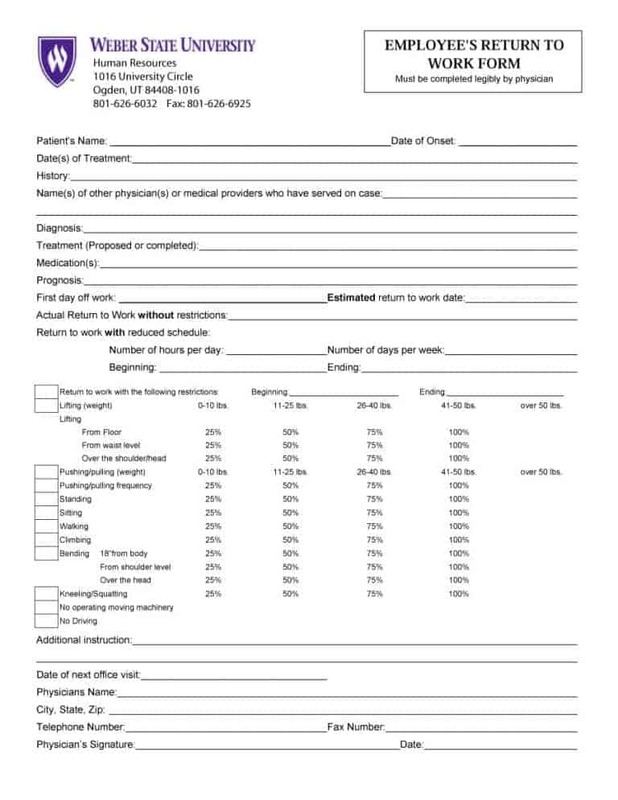 While you may be able to keep track of absences without the aforementioned form, the information you’ll have will be shallow. 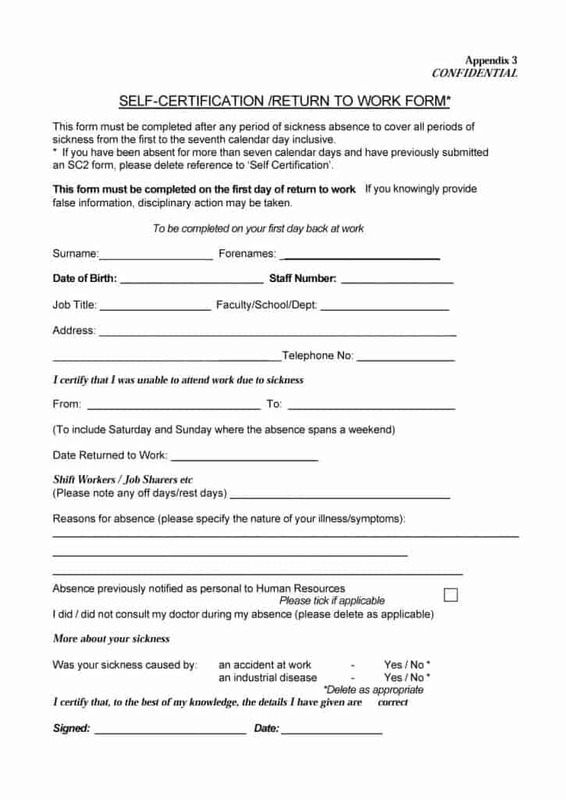 On the other hand, a return to work form will give you access to the background information i.e. the reason (s) behind the absence. 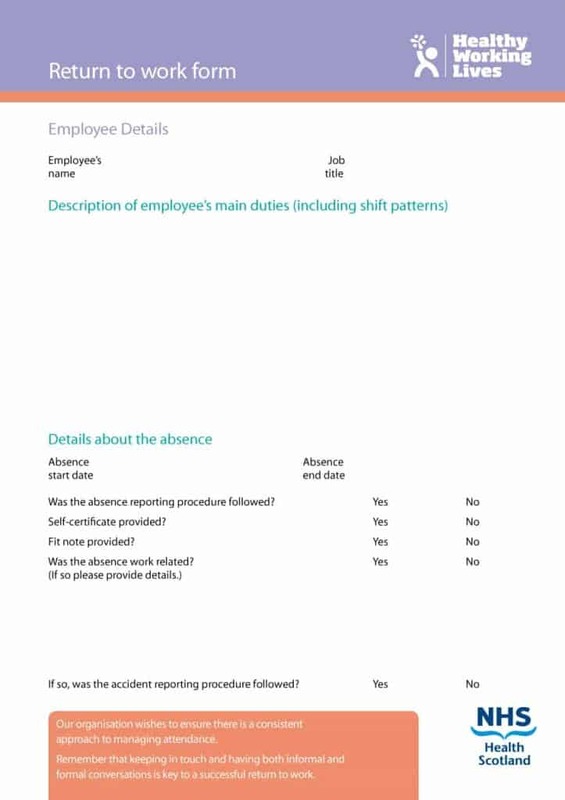 The information you get from the form may help you to reduce workplace absences. For instance, if the forms indicate that most of the absences are due to headaches and back pain then you can reduce absences in the future by correcting your lighting or seating. Some studies prove that having a return to work process in place allows companies to reduce their sickness absence rate. There are several reasons for the above. First of all, a return to work process indicates to employees that you take absences seriously and being absent from work without any genuine reason is discouraged. Secondly and most importantly, a return to work process will ensure that employees who previously may have taken the odd day off just because they didn’t feel like coming to work have the ‘fear factor’ and are wary of being ‘found out’. 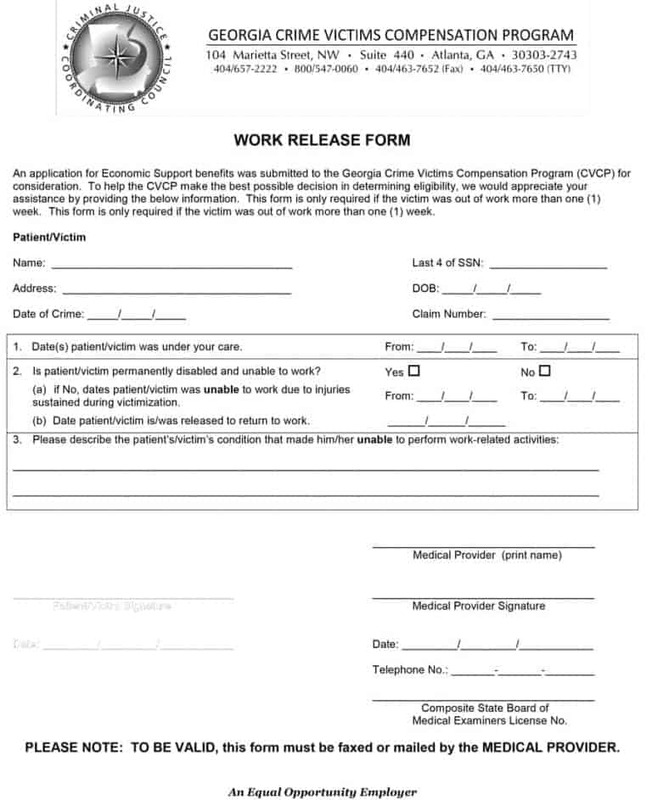 Generally, organizations don’t ask employees who have been absent for less than a week to provide a medical document for their illness. 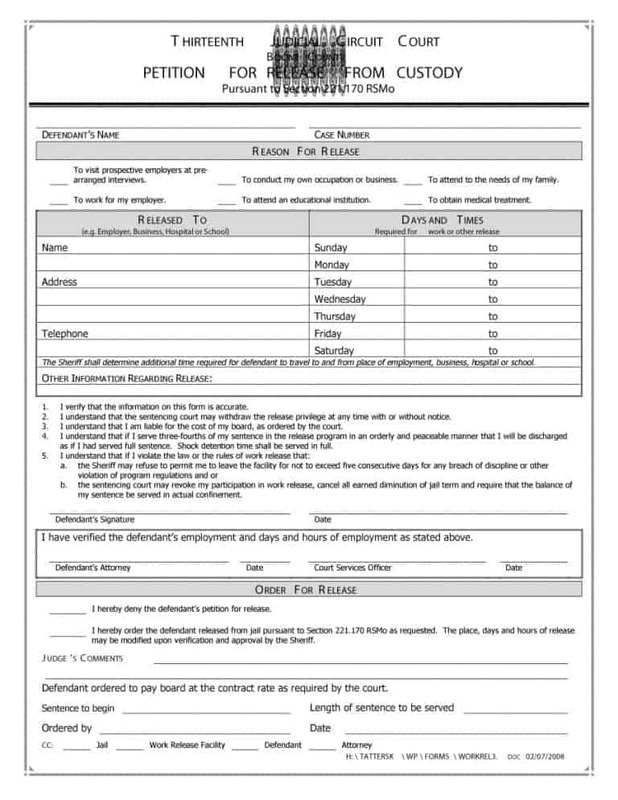 So, for sick absences of less than a week, using a return to work form might be a good way to judge whether the absence of the employee is justified or not. Another reason to use a return to work form is preventing the ‘too sick to work’ employees from returning to work. 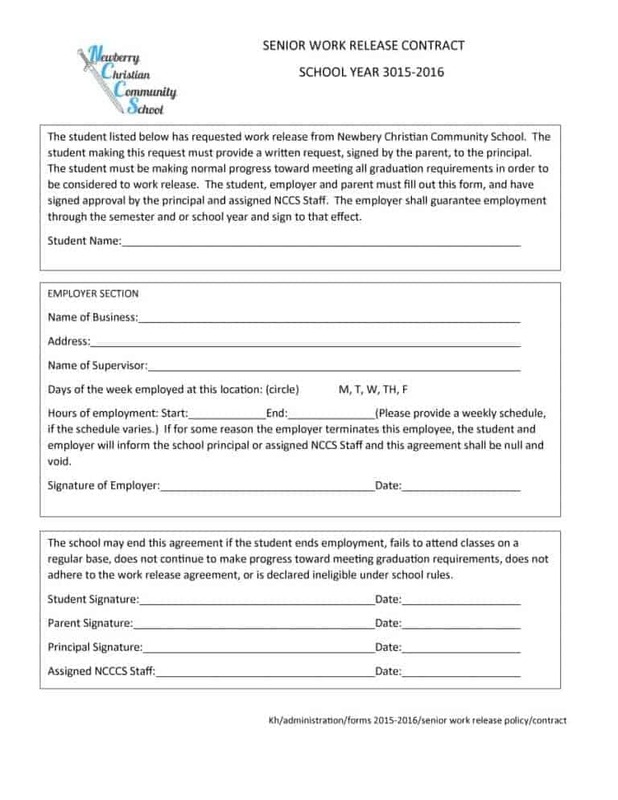 By ensuring the aforementioned things, employers will be able to use the work release form to minimize absences in the workplace. So how can employers ensure the aforementioned things? Let’s find out. 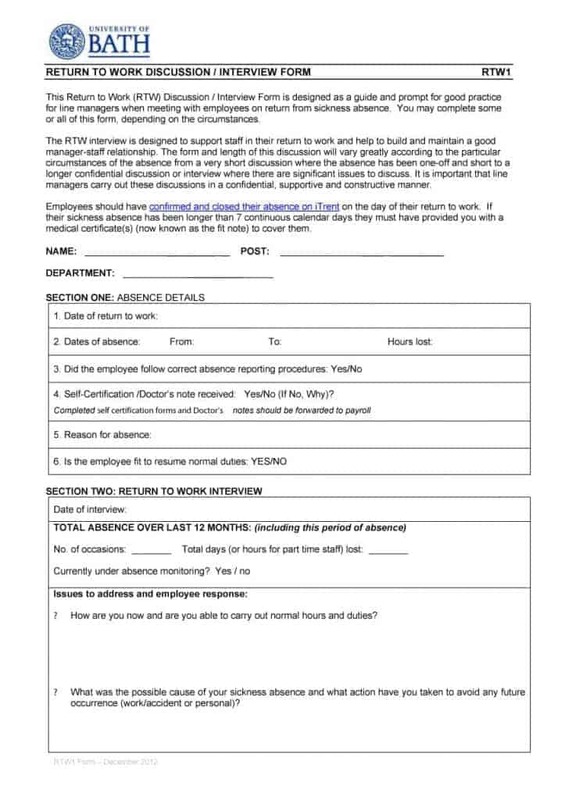 It is important that the return to work form you use in your workplace is the same for everyone. 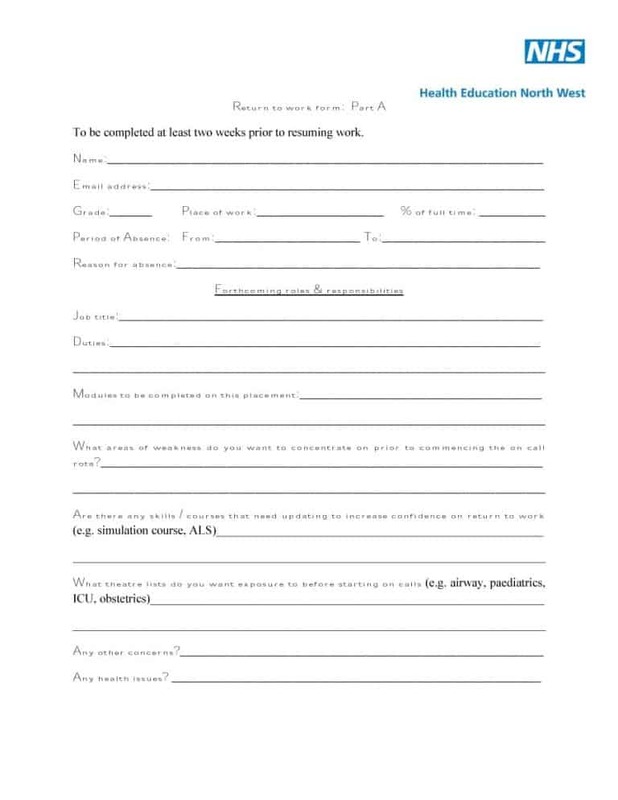 It is crucial that top leadership, managers, and the working staff fill out the same form. If employers show any favoritism in this regard, they will only promote disgruntlement and confrontations. 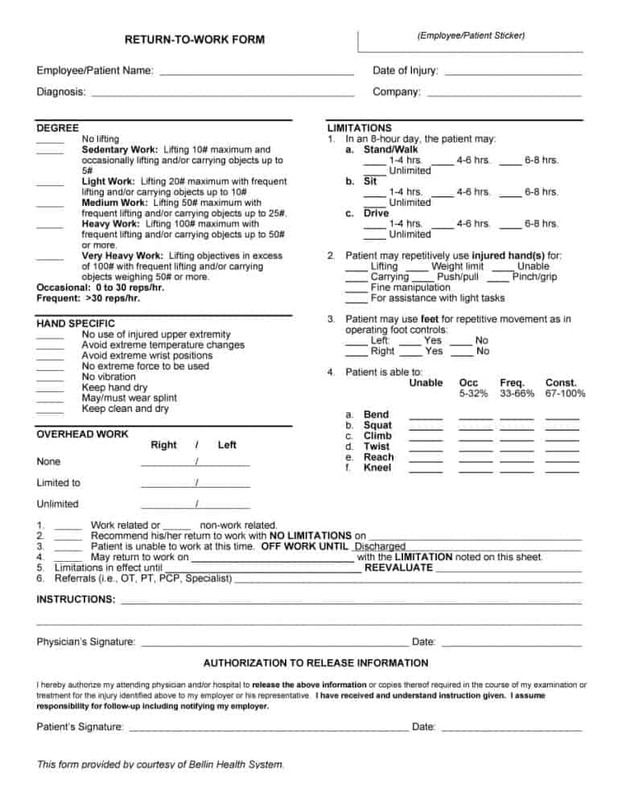 It is extremely important that the aforementioned form is accurate. 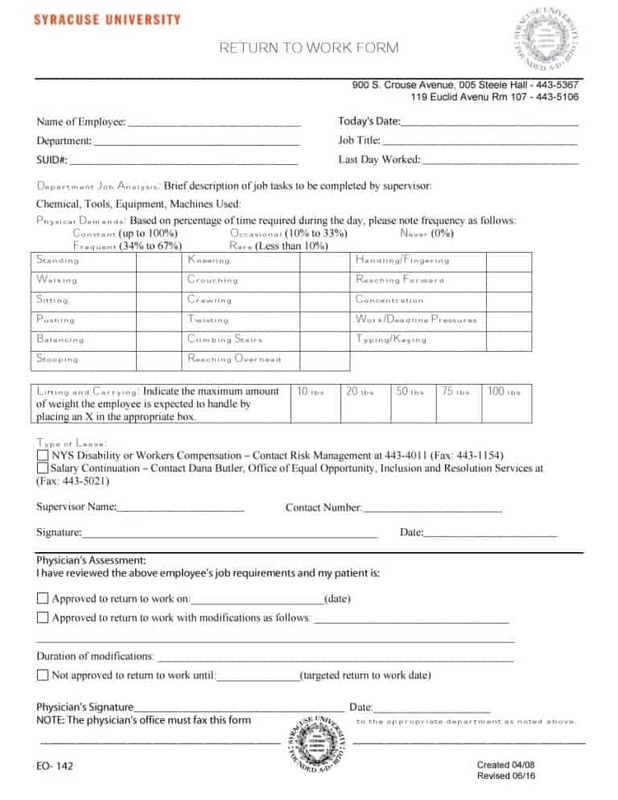 The form must allow employees to explain why they were absent from work. The information they provide is important and can save you from unnecessary problems in the future. 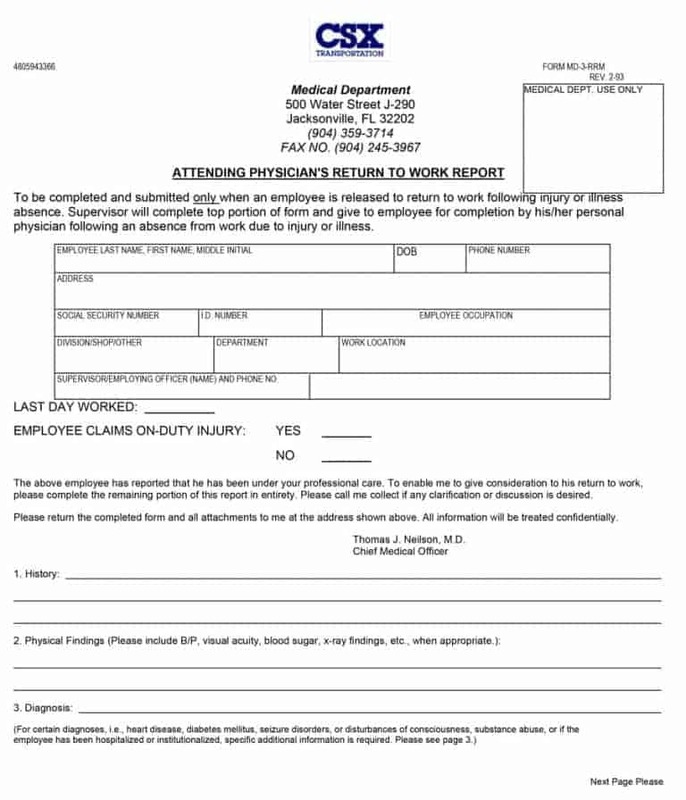 It is important for employers to plan the return of an absent employee. A key part of this planning is having a well-prepared return to work form. 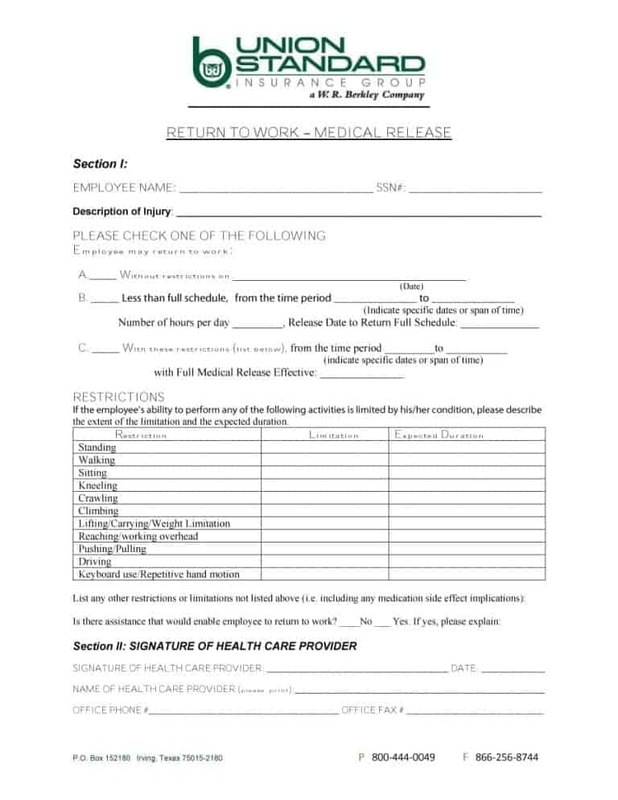 By creating a well-prepared return to work form, you’ll ensure that you’re ready to deal with employee as soon as he/she returns from absence. 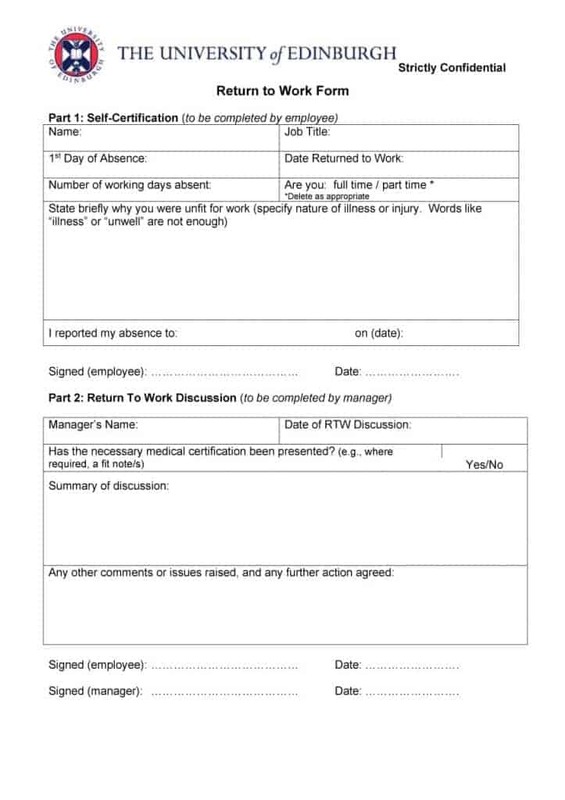 Not many employers ensure this but keeping the return to work form is extremely important. 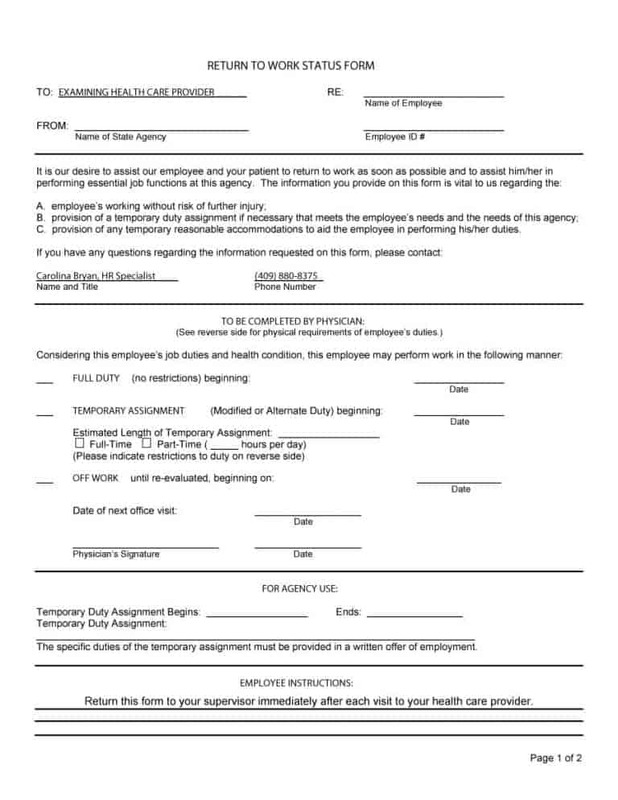 Basically, both the employer and his/her manager should sign the aforementioned form. This will help prevent arguments and contradictions in the future. If you use an appropriate return to work form, dealing with employee absences will become a painless experience for you. 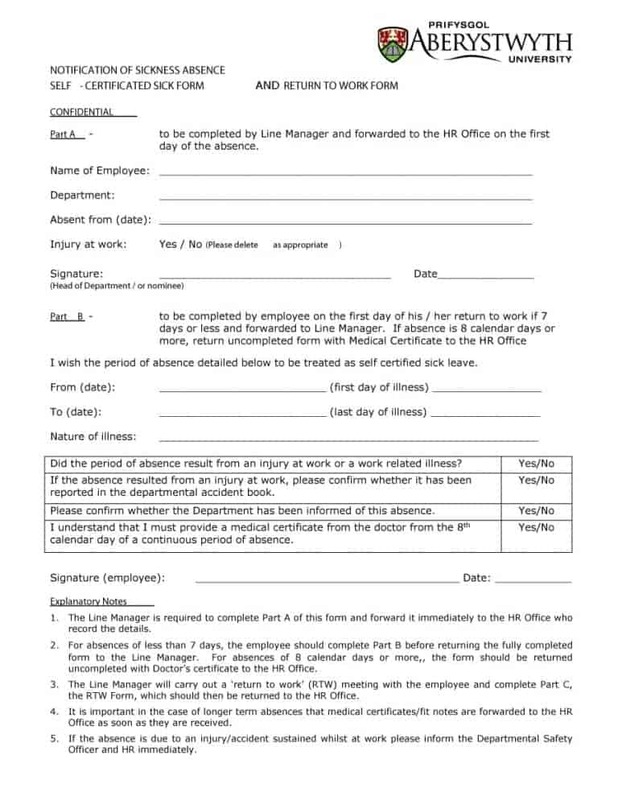 To find out what an appropriate return to work form contains, search for printable return to work forms online. 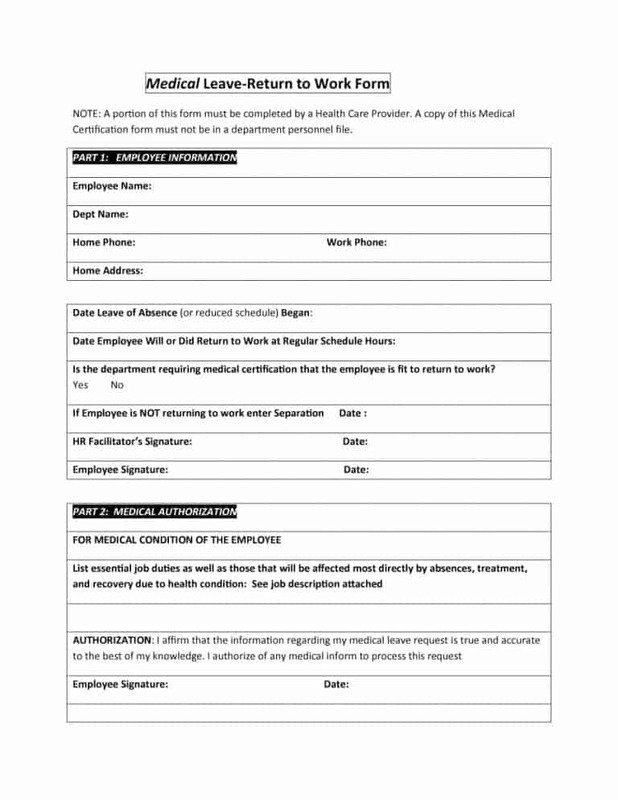 In addition to the return to work form, other medical forms that you can find online include the emergency contact form and the patient registration form. 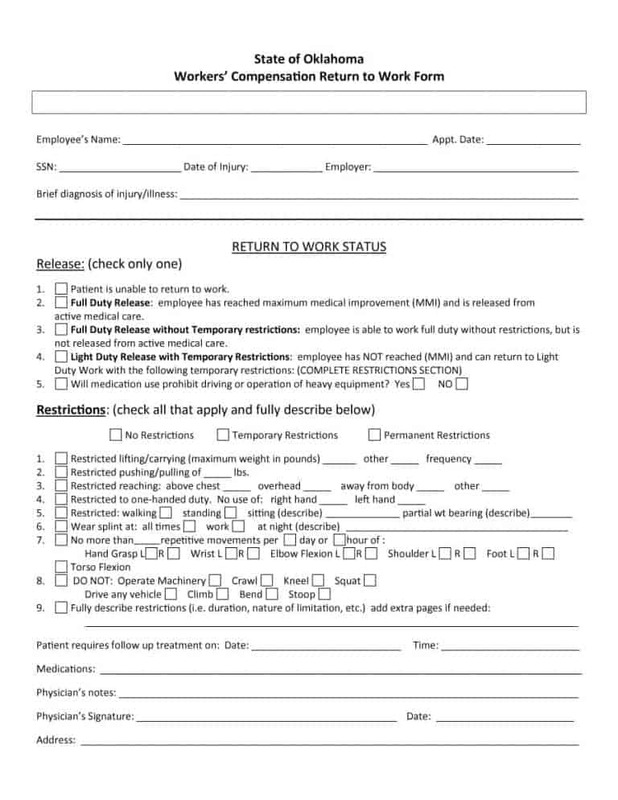 Using a return to work form is a good way to facilitate the return of sick employees to the workplace. 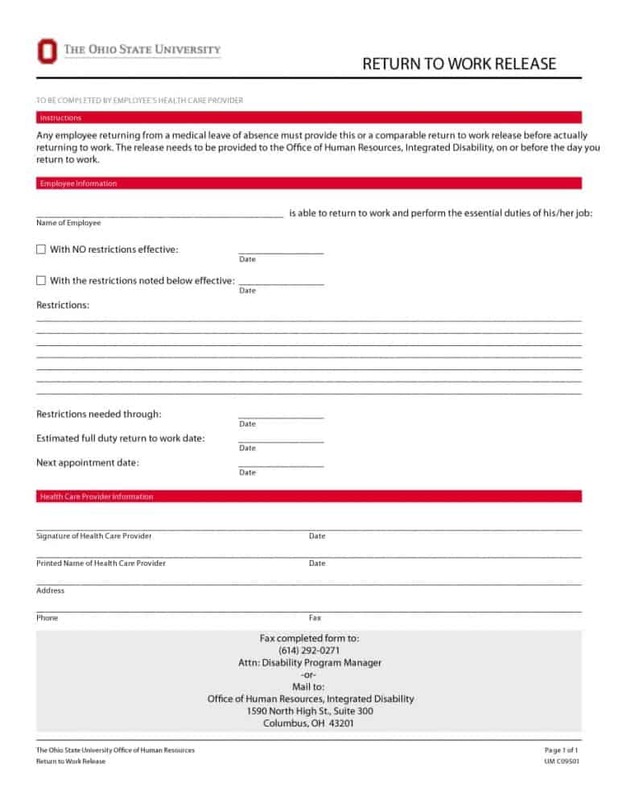 Moreover, the form allows injured or ill employees to stay at home. In short, a return to work form is a safe and productive way of dealing with employees who’ve been away from work due to sickness. Already having a return to work policy to deal with any absences is probably the best situation to be in. However, it’s never too late to get started and create a suitable return to work process. 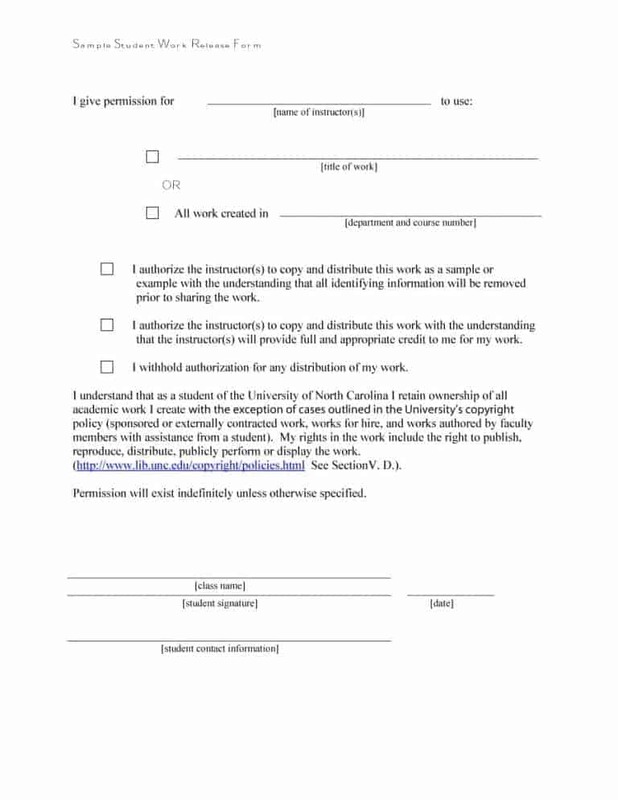 As mentioned above, a key part of the return to work process is the return to work form. 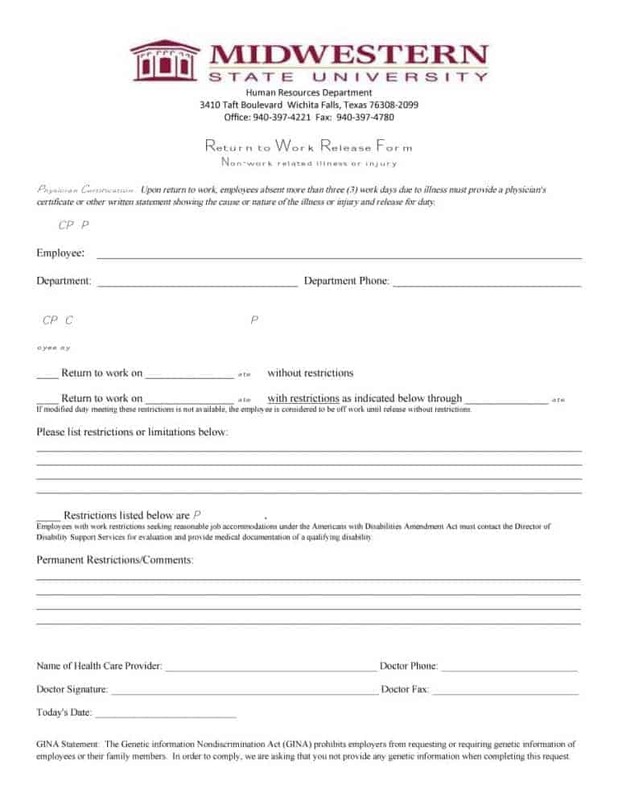 The form allows employers to deal with the returning employees on an individual basis. 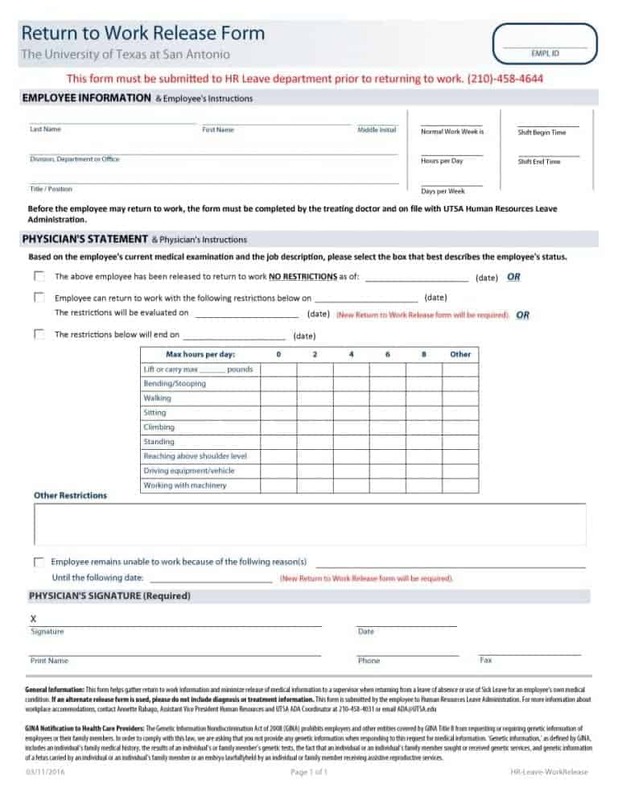 It is important that the employer and the employees cooperate and coordinate with each other to draft the aforementioned form. 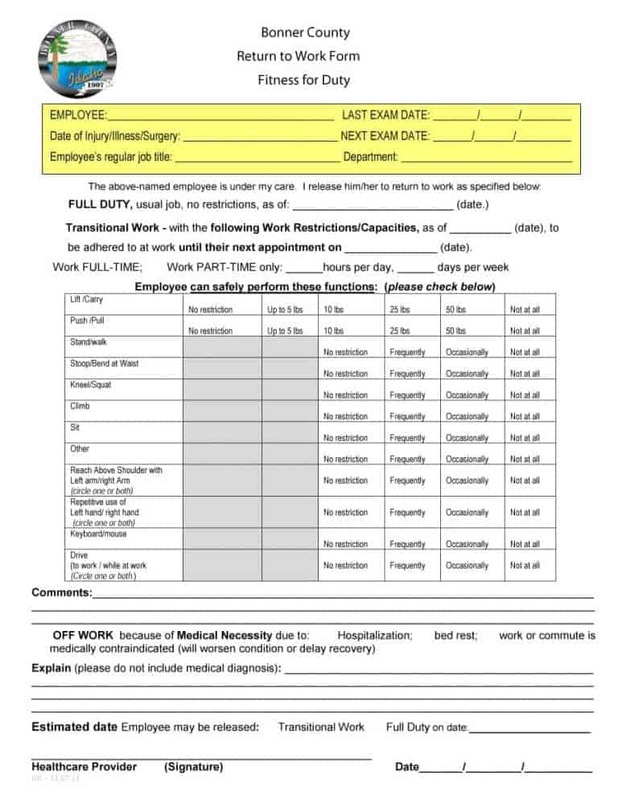 As each workplace is unique, not all return to work forms will be the same. 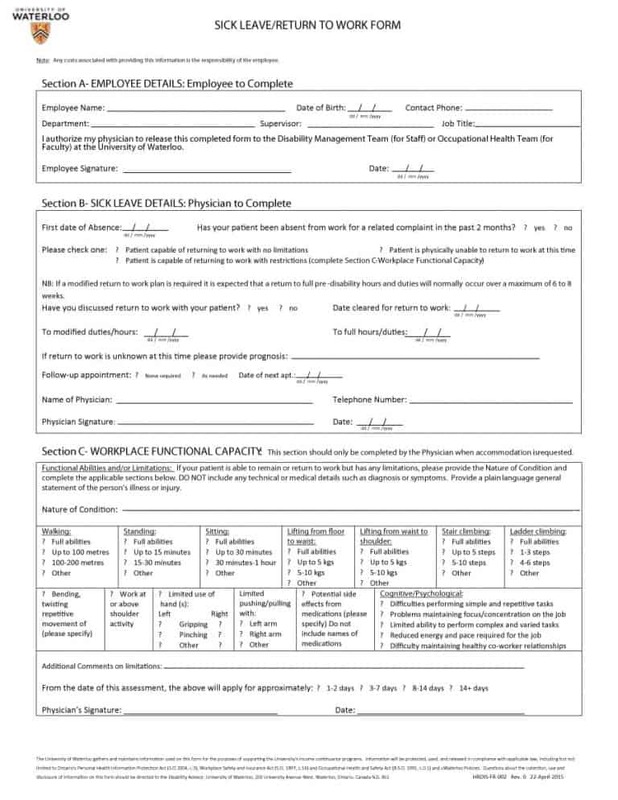 Also, as each employee is unique, it is important to create a flexible form that can be customized to deal with the specific needs/problems of an employee. After you finally recover from a prolonged illness, the last thing that you should have to worry about is your return to work form. Worrying about their return to work form prevents workers from thinking about other more important things such as the ways to regain optimal health and how to make up for lost time. 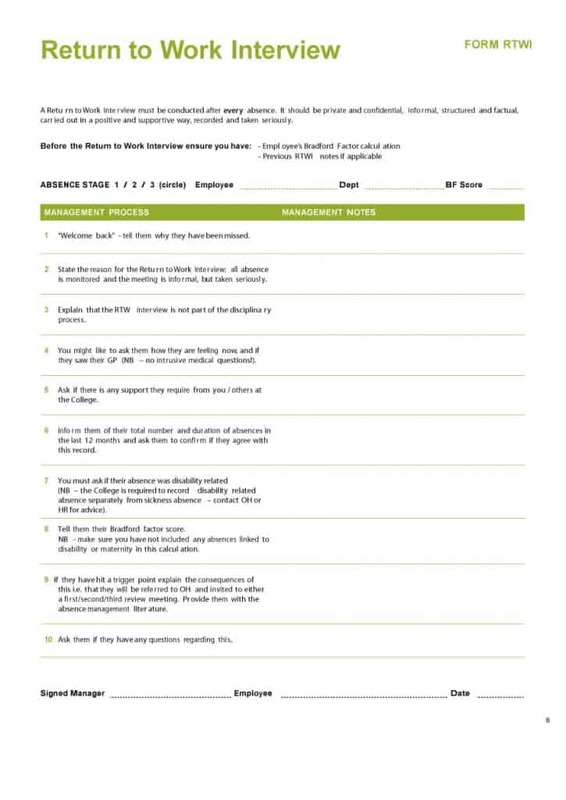 A good way for workers to avoid the above is using a checklist for the things they’ll need to complete the return to work form. 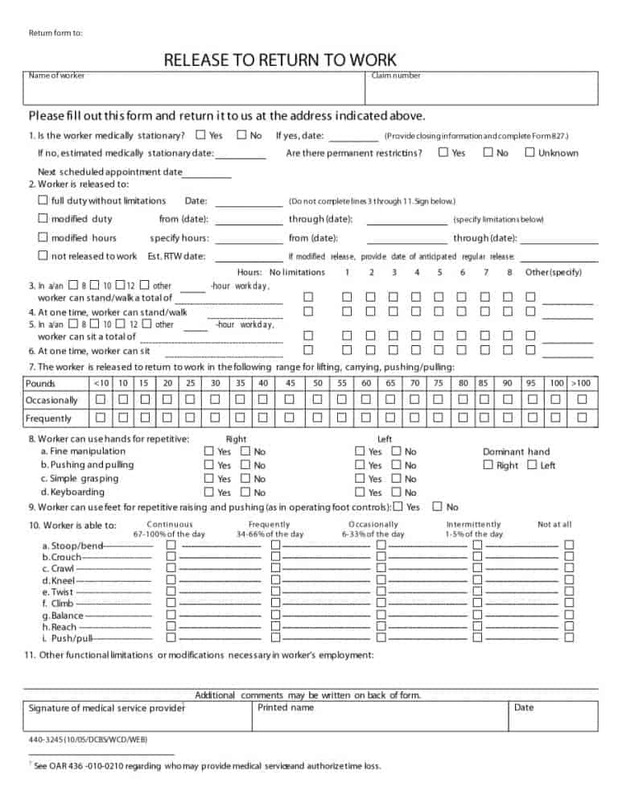 So, what is the information employees need to complete the aforementioned form? 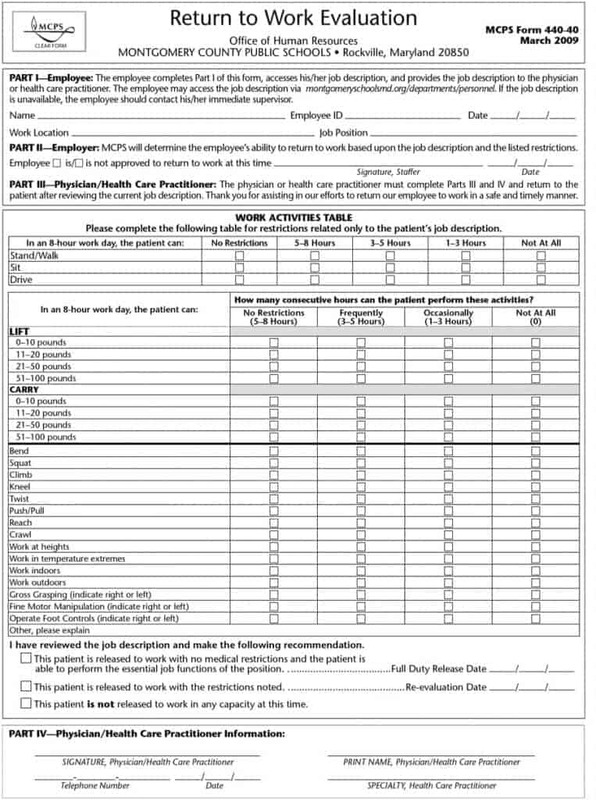 Employees need the following things/information to complete the form. 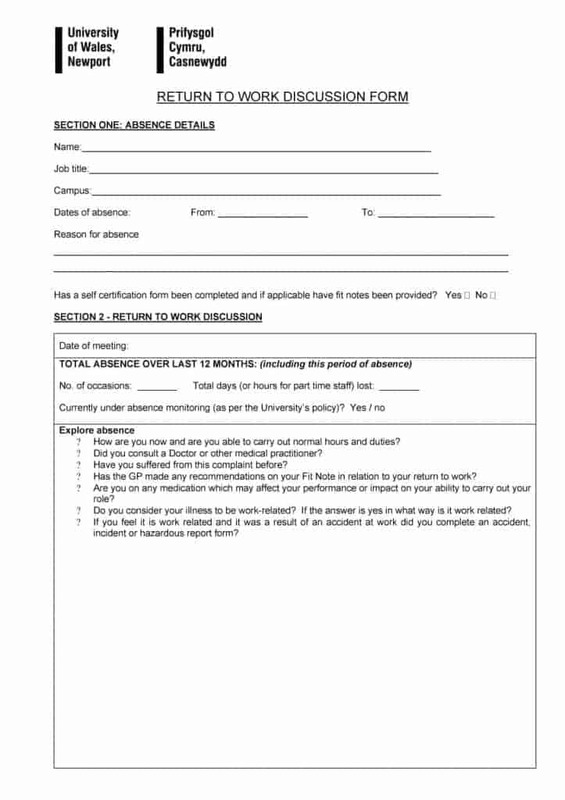 The aforementioned information is necessary to complete the return to work form. 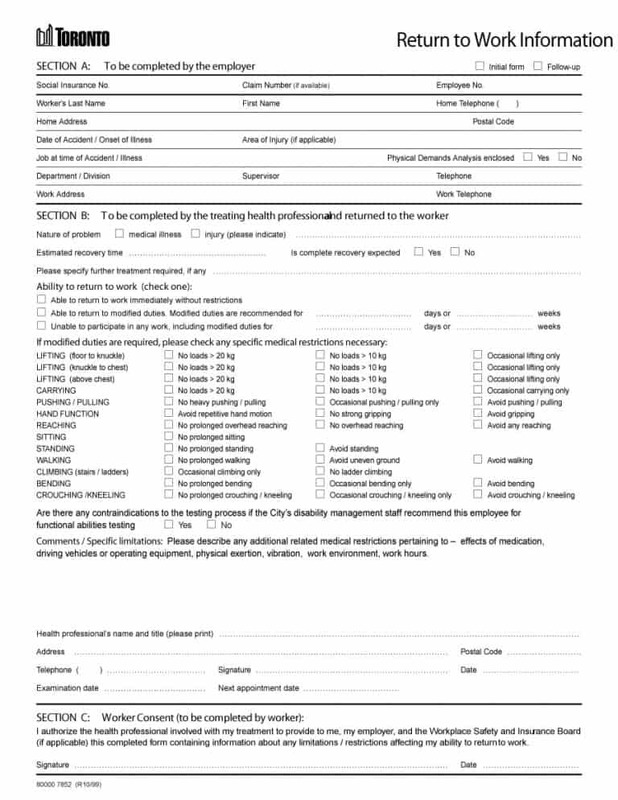 Additionally, employees will use the form to inform the employer whether they are ready to work normal hours, have consulted a doctor and are using a medication that may affect their workplace performance. 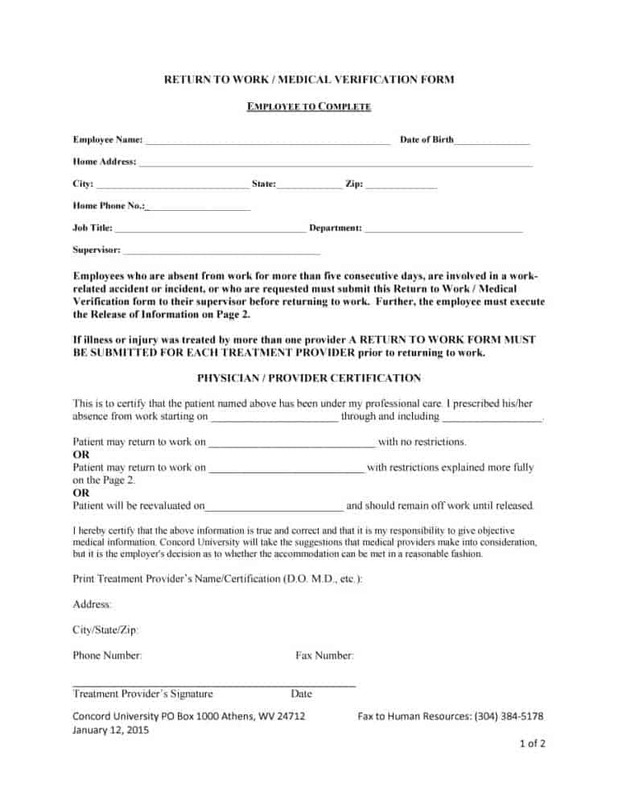 Also, the form will notify the employer whether or not the illness of the worker is work related. 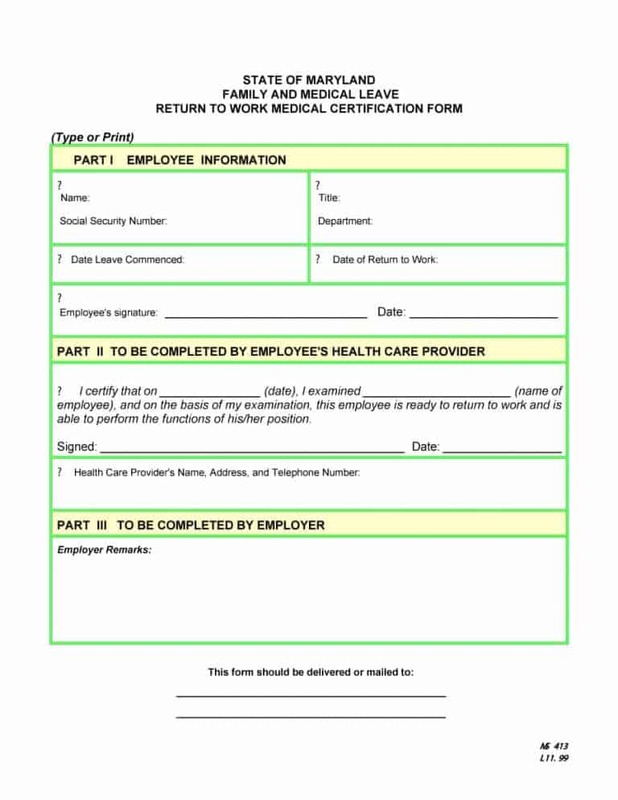 A return to work form is extremely useful for both employers and employees. 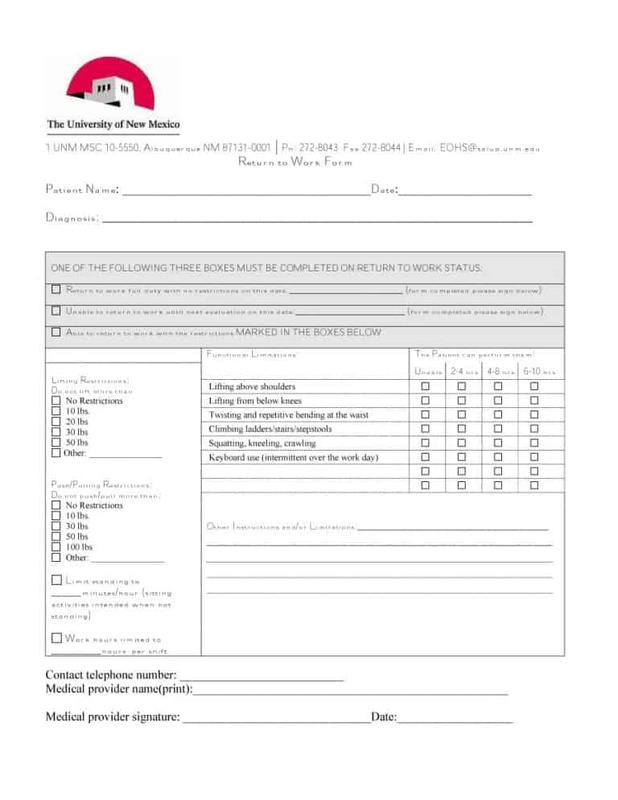 The form can help facilitate the employee’s return to the workplace and is a good way for employers to reduce the workplace absences caused by sickness. However, to get the benefits of a return to work form, employers must draft it appropriately. 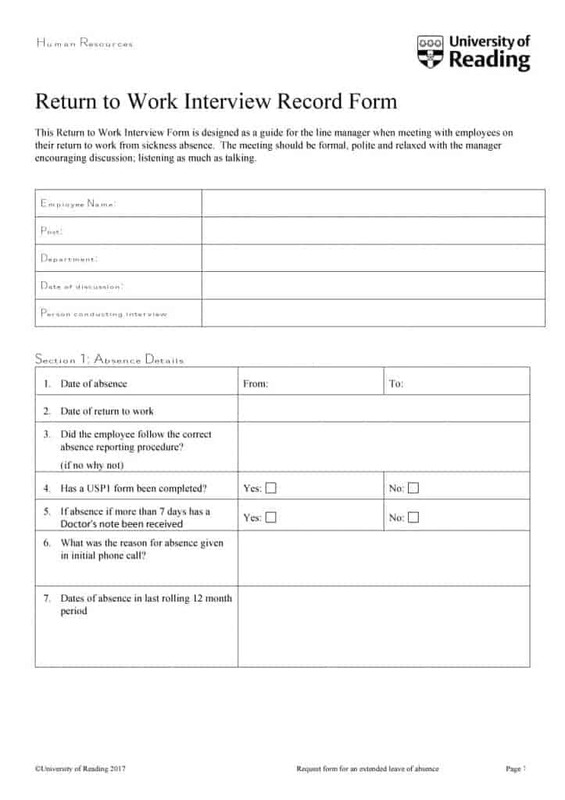 A good way to create the right return to work form for your workplace is using the printable return to work form available online for reference. 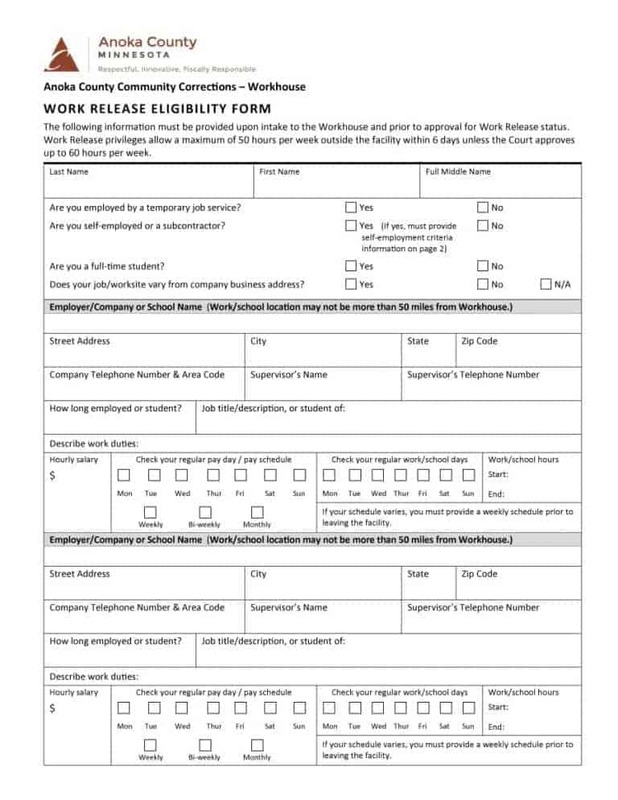 The work release form available online will help you to draft a form which is right for you and your employer.